Energy Globe 2019 – submit now! we would like to encourage you to take part with your environmental project in the Energy Globe Award 2019! With 182 participating countries, Energy Globe is the biggest platform for sustainability and the world’s number 1 environmental award. Our most important goal is to introduce and award innovative showcase projects and smart technologies from all over the world that are capable of creating sustainable change. Projects such as yours can provide an important contribution. The Energy Globe Award is presented in the 5 categories of Earth, Fire, Water, Air – the 4 basic elements of life - and Youth, projects implemented by young people. Projects with a focus on the conservation of resources, improvement of air and water quality, energy efficiency, use of renewable energies, recycling or creating awareness for these areas can be submitted. The best projects of each individual country are presented with national awards. 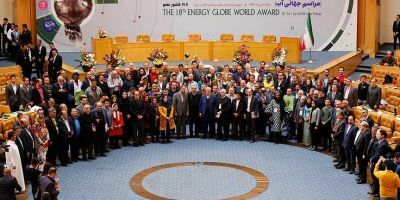 Each year, the international Energy Globe Awards for each of 5 categories are presented in the course of a ceremony by international celebrities. A 10,000 Euro cash prize is distributed among the winners. Your project is an important stepping stone towards a more livable world for all of us. No project is too small, no project is too big! We are looking forward to your project entry!